WEST LAFAYETTE, Ind. - An emerging class of electrically conductive plastics called "radical polymers" may bring low-cost, transparent solar cells, flexible and lightweight batteries and ultrathin antistatic coatings for consumer electronics and aircraft. The PTMA is in a class of electrically active polymers that could bring inexpensive transparent solar cells; antistatic and antiglare coatings for cellphone displays; antistatic coverings for aircraft to protect against lightning strikes; flexible computer flash drives; and thermoelectric devices, which generate electricity from heat. Recent research findings were detailed in a paper published online in May in the journal Macromolecules. A review article on the subject appeared in September in the same journal and is featured on the cover. The American Chemical Society also has recorded a series of podcast with Boudouris, accessible at http://pubs.acs.org/page/mamobx/audio/index.html. Polymers are strings of molecules with a central backbone and may contain side chains called "pendant groups" that dangle from the central structure. 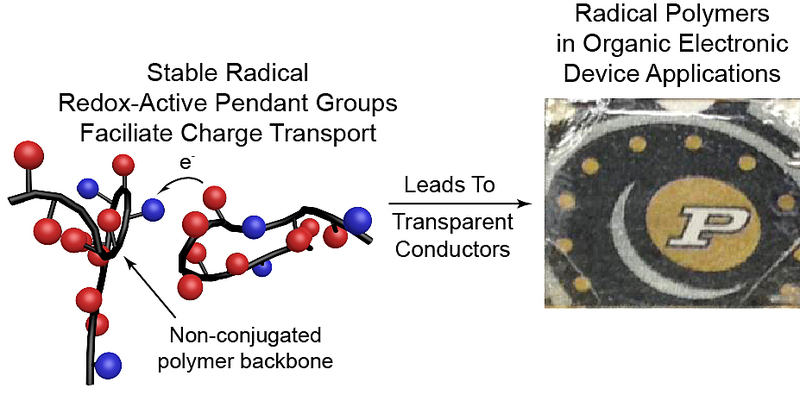 In radical polymers, it's these pendant groups that allow charge to be transported, conducting current. "We just finally studied deprotection in a way others had not to learn how it affects the electronic properties of the radical polymers," Boudouris said. Electrons surround an atom's nucleus in "shells" and these electrons are usually paired. The oxygen atom in PTMA, however, has one unpaired electron in its outer shell, making it amendable to transporting charge. "So manipulating the reaction conditions for this deprotection step, and monitoring closely the resultant chemical functionalities, is critical in tuning the electrical properties of radical polymers," Boudouris said. The research is ongoing and has been funded by the National Science Foundation (NSF), the Air Force Office of Scientific Research (AFOSR) and the Defense Advanced Research Projects Agency (DARPA). Macromolecules bearing stable radical groups have emerged as extremely useful active materials in organic electronic applications ranging from magnetic devices to flexible batteries. Critical to the success of these open-shell polymers has been the readily tunable nature of their molecular architectures; this important molecular structure-property-performance design paradigm has allowed for significant device performance metrics to be achieved. In this Perspective, the recent advancements regarding the design and device functionality of a common class of open-shell macromolecules, radical polymers, are discussed. Here, radical polymers are defined as macromolecules with nonconjugated carbon backbones, whose optoelectronic functionalities arise due to the presence of stable radical sites on the pendant groups of macromolecular chains. This class of materials provides a unique platform for the design of unique optical and electronic properties in soft materials; however, as with many organic electronic materials, transitioning these gains from the laboratory to the commercial scale remains a primary challenge. As such, we provide context for the significant accomplishments that have been made in the field, describe how these advances have been translated to high-performance devices, and discuss future areas of evaluation for these next-generation polymer electronic materials.